‘Time Out’ is Priit Pärn’s fifth film, but the first to gain a widespread attention, and to win a number of international prizes. It shows the filmmaker’s idiosyncratic style and unique surrealism, without the dark side, often present in his other films. The film is filled with child-like wonder, and a happy atmosphere, enhanced by the joyful reggae music by composer Olav Ehala. The film opens with a room in which a very stressed out cat lives. The cat is in a constant need to check his alarm clock, which is on a shelf too high for him. When he finally reaches the clock, he discovers he can’t read it without his glasses, so he has to find them first, etc. Pärn shows this pointless ritual in several variations over and over again, following the cat running around in his room. At one point, however, the alarm clock breaks, and time stands still. At this point of the film the cat finds himself in a fantastic world where everything can happen. This part is extremely rich in visual tricks, which go all the way back to Émile Cohl’s ‘Fantasmagorie‘ (1908). Nothing is what it seems, and metamorphosis runs freely. Unfortunately, in the end, time is restored, and the cat has to face his former stressful life once again. ‘Time Out’ certainly shows Priit Pärn’s mastery, and excellent timing. His fantasy is extraordinary, and the film shows the power of animation like few other films do. It’s also a reminder that we should snap out of the daily routine, and let our mind wander, and be really creative. When one takes time, everything may be possible! An old woman lives in a little flat and uses her collection of matchboxes to dream away to more adventurous lives. In this film Rao contrasts the dull and lonely reality (in grey tones) with the colorful matchbox-based fantasies. The mood is poetic, and the film progresses at a gentle speed. Rao’s designs are sometimes naive, but her animation skills are splendid. She’s absolutely one of the masters of painted animation. Especially noteworthy is her animation of the cat. Also important is Rajivan Ayyappan’s sound design, which is spot on. ‘Printed Rainbow’ is by all means a mature work. Rao’s work is even more impressive, when one considers that she wrote, animated, directed and produced the film on her own in India, a country with a rather short animation history. 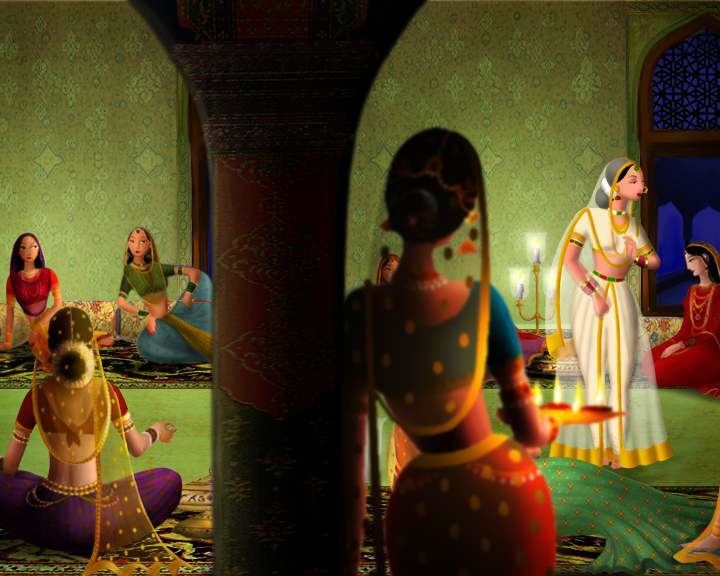 Although India has made some strides in commercial animation, independent animation is still very rare. Thus Rao’s work is all the more wonderful. Luckily, more people saw it that way and Rao’s film won no less than 22 awards.